are staying mum, while Oregon's bolder brand of elected official is stepping out in favor of the Northwest's token fish. A couple of this region's putative leaders are actually trying to exert some leadership in the long-running dispute over the restoration of Snake River salmon. They're not from Washington. 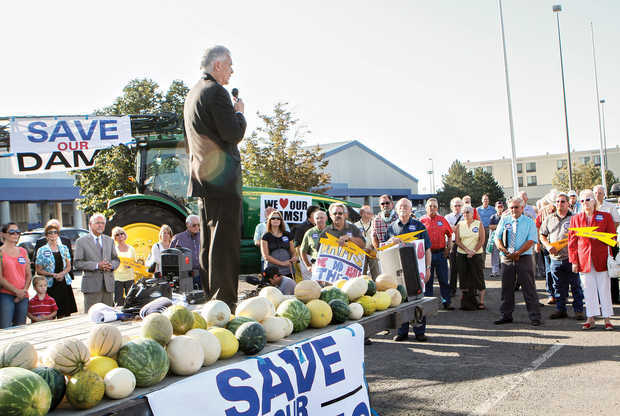 Oregon Governor John Kitzhaber has proposed that all the interested parties -- you can call them "stakeholders" or you can call them "vested interests;" he does neither -- sit down and work out a salmon restoration plan to finally end 20 years of litigation over the dams. Environmental groups and tribes that have long wanted the federal government to breach the four lower Snake River dams -- and have consistently persuaded the federal courts to reject biological opinions on operation of the federal Columbia River system dams -- have responded enthusiastically. "The status quo policies of the federal agencies for wild salmon over the past decade have failed our salmon, communities and region," said Bill Arthur, deputy national field director for the Sierra Club, in a press release. "The path forward that Governor Kitzhaber is suggesting is a badly needed breath of fresh air." Oregon Senator Ron Wyden has chimed in too. "Time and time again we've seen that good things happen when folks agree to meet face-to-face and tackle the tough issues facing Oregon," Wyden said. "I'm glad to see that Governor Kitzhaber has taken the initiative and announced his support for a roundtable that will bring together tribes, fishermen, farmers, power customers, conservationists and officials from state and local governments to discuss Northwest salmon issues. This is the kind of collaborative process that the region needs to find a solution to such a thorny issue." Four populations of Snake River salmon (sockeye, steelhead, and both spring/summer and fall chinook) have been listed as threatened or endangered. The fish spawn in the mountains of central Idaho, where their spawning habitat is protected by federal wilderness areas. If temperatures increase over the coming decades and other streams become too warm for salmon, it may become the only productive spawning habit left in the entire Columbia River system. But even there the fish haven't fared well. On a journey to or from the ocean, they must run a gauntlet of eight dams, four on the mainstem Columbia and four on the lower Snake. Those Snake River dams, completed in the 1960s and 1970s, generate electricity, provide pools from which some farmers draw irrigation water, and support a lock system that has made Lewiston, Idaho, 435 miles from the ocean, into a deepwater barge port. Salmon advocates have long argued that Snake River salmon populations won't recover substantially unless the federal government breaches the lower Snake River dams. The Northwest Power Planning and Conservation Council estimates that the dams could be breached without driving up people's utility bills. But if they were breached, some Washington and Idaho farmers would have to find other ways to get their grain down the river. And the port of Lewiston would be out of luck. Since the first Snake River salmon population was listed in 1991, the federal government has produced five biological opinions (BiOps) outlining the impact and improvements to the operation of its Columbia River system dams. One was withdrawn voluntarily. The other four have been rejected by the courts. Last year, U.S.District Judge James Redden rejected the National Marine Fishery Service's latest BiOp -- prepared by the Bush administration and tweaked but not basically altered under Obama -- for operation of the federal Columbia River system hydro dams. Redden gave the feds until Jan. 1, 2014 to come up with something better. That means any serious effort to transcend the status quo must be made next year. That last BiOp included no serious contingency for breaching the Snake River dams. Rather, it assumed that some improvements in dam operation and largely-uncertain improvements in habitat would be enough to recover the fish. This provided some cover for regional politicians, who wanted to defend the status quo. Inconveniently, it didn't survive judicial scrutiny. Redden rejected the BiOp because it relied heavily on habitat improvements that hadn't even been identified, much less found likely to work. He didn't even have to deal with other problems that he had already discussed in letters to the attorneys in the case. But presumably, if the feds want to create a BiOp that will survive the federal courts next time around, they will have to deal with those problems sooner or later. Most regional and national politicians shy away from using the "B" word, but it's hard to believe that the courts will approve a biological opinion that doesn't present dam-breaching as a serious option. Even before Redden tossed the last BiOp, he had told lawyers in the case that he wanted at least a contingency plan for dam breaching. He had proposed "developing a ... plan to study specific, alternative hydro actions, such as flow augmentation and/or reservoir drawdowns, as well as what it will take to breach the lower Snake River dams if all other measures fail." The judge wasn't the only one who thought breaching should be on the table. Around the time Redden remanded the BiOp to the feds, the Western Division of the American Fisheries Society resolved that "the four lower Snake River dams and reservoirs are a significant threat to the continued existence of remaining Snake River salmon, steelhead, Pacific lamprey and white sturgeon." Consequently, "if society-at-large wishes to restore Snake River salmon, steelhead, Pacific lamprey, and white sturgeon to sustainable, fishable levels, then a significant portion of the lower Snake River must be returned to a free-flowing condition by breaching the four lower Snake River dams." The Kitzhaber statement stands out in part because there is so little news to report about the situation. The feds have indicated no willingness to move past the failed concepts of the last BiOp. If you read the federal agencies' latest progress report, you'll find that the salmon are doing just fine without breaching.The report hails "marked improvements in survival of juvenile spring chinook and steelhead" at The Dalles, McNary and Bonneville dams, noting that "travel time for juvenile salmon and steelhead migrating through the hydrosystem was among the fastest scientists have observed. NOAA believes this is likely due to high levels of flow in 2011 and the continued use of spill and surface bypass at the dams." The feds didn't acknowledge that the spring spill had been ordered by the federal court. They also somehow failed to note that in 2010 the feds were going to cut it short, until the weight of scientific opinion against them made it clear that they were going to lose in court, and they decided to keep spilling water without a new court order. The report is "basically a couple hundred page commercial for the action agencies," says Earthjustice attorney Steve Mashuda. "The problem we've always had," Mashuda says, is that "they've set these performance standards based on things they knew they could achieve." In this case, "we've been achieving those standards for years, based only on spill." Mashuda sees this year's progress report as just more of the same. "Lo and behold," he says, "they come out this year with another report that says 'we're meeting our dam passage requirements; we're doing a great job.'" Not only is the fact that litigation forced the feds to spill water over the dams not mentioned; the report also obscures the fact that "survival over the concrete . . . doesn't tell you anything about total survival through the system." Mashuda says that delayed mortality is "kind of the elephant in the room in any discussion of the hydro system." That is, even if the fish do well on their passage downstream, when they come back, the more dams separate them from their spawning streams, the fewer of them survive. Mashuda argues that "the absence of information . . . says more than the information provided." Washington politicians' failure to admit that the current system doesn't work or to publicly contemplate anything different says a lot, too. Does Washington's Congressional delegation have anything new to offer? Washington's gubernatorial candidates certainly didn't. Eastern Washington Congressman Doc Hastings has made it clear that he won't even consider breaching. Some other politicians pretend one can restore the salmon runs without seriously altering the status quo -- if they say anything at all. And some -- Murray and Cantwell -- have reportedy worked behind the scenes to limit scientific review of the government's salmon strategies. In addition to fudging the science, the Bush Administration made a deal -- in fact, a whole series of deals -- to help the last biological opinion survive. The state of Washington got $40-odd million in federal money to improve habitat on the north side of the Columbia River estuary. The Warm Springs, Yakama and Umatilla tribes and the Confederated Tribes of the Colville Reservation recently signed an agreement with the Bonneville Power Administration, the U.S. Army Corps of Engineers and the Bureau of Reclamation that gave the tribes a billion dollars over ten years for habitat and hatcheries. The states of Idaho and Montana got habitat money, too. The quid pro quo was supporting the status quo, which meant not challenging the BiOp in court, or speaking ill of it in public. The attempt to guarantee a future much like the past didn't work. The feds couldn't buy everyone off. The State of Oregon, the Nez Perce tribe and the non-sovereign plaintiffs carried on the suit against the BiOp. And the feds couldn't buy the federal courts, in which those plaintiffs ultimately won. So the region now faces a choice between backing another attempt to justify the status quo or figuring out Plan B. The Nez Perce addressed all this in a September letter to Idaho Senator Mike Crapo. "The [Nez Perce] Tribe believes that among the lessons learned in the most recent round of this longstanding litigation are two that should strike all parties, on all sides -- and perhaps collaborative political leaders such as you even more -- as particularly significant," tribal vice- chair Brooklyn Baptiste wrote. "First," Baptiste observed, "operational plans that address the concerns of only a segment of stakeholders in a complex matter of litigation do not work. . . . Second, the long-term certainty that was the apparent intention of the accords signed by many state and tribal sovereigns [whose support for the BiOp the federal government basically bought] does not exist. The . . . District Court's recent ruling concludes that the present plan of operations for the lower Snake River and mainstem hydro system does not satisfy the law." The tribe, like Kitzhaber, argued for getting everyone around a table. It believes, Baptiste wrote, that "there will be value in establishing a stakeholder 'solutions table' to explore all scientifically-sound options and to help develop recommendations to the Administration and Congress." Some private citizens have argued for the same thing. "I grew up in Eastern Washington fishing and hunting with my father on the Snake River Breaks, now under stagnant reservoirs," wrote Chris Kopczynski, a native of Eastern Washington and the second-generation president of a Spokane building contractor established in 1946, wrote in the Spokane Spokesman-Review "As a business owner and taxpayer," Kopczynski wrote, "I'm appalled at the billions spent on half-hearted recovery programs by foot-dragging federal agencies. ... Litigation should be a last option. But . . .litigation gets credit for most of the progress made for salmon." Now, he argued, "there's a better way: a science-guided stakeholder process in which fishermen and farmers, energy users and shippers, conservationists and businesses develop solutions together, in an open process, with support and leadership from Sens. Maria Cantwell and Patty Murray. Such a process could assess the science of spill, dam removal and other recovery measures, along with the economic costs and benefits of these measures versus the status quo." Why have Washington's politicians -- with the notable exception of Representative Doc Hastings, an outspoken defender of the dams -- said so little about this issue? One can argue that they're in a no-win political situation. Arguably, Kitzhaber and Wyden face a much less complicated balancing act than do politicians from Washington state. None of their consituents relies on the lower Snake River dams for barging or irrigation. (And the liberal environmentalists of metropolitan Portland are close to the river, while those of metropolitan Seattle are far away.) Under the circumstances, it's relatively easy to be statesmanlike -- which doesn't change the fact that they're the only elected officials acting remotely like statesmen. But they're not the only regional politicians to suggest a conversation. In fact, Kitzhaber's op-ed	echoed earlier calls to sit everyone down and put everything on the table. Three years ago, Idaho Senators Mike Crapo and Jim Risch, both Republicans, and Oregon Senator Jeff Merkley, a Democrat, called on the administration to set up such a conversation. That hardly sounds radical. How can anyone object to assembling everybody with a vested interest in the river to talk about a solution? (Make that a narrow vested interest; all U.S. citizens have an interest in the hydro system, and in the threatened and endangered fish.) It's hard to argue against just talking. But one can guess where such a discussion might go. Virtually everyone can be made whole. All it takes is federal money -- and a willingness to at least consider throwing Snake River barging interests under the bus. Maybe restoring Snake River salmon runs would require breaching the lower Snake dams. Maybe it wouldn't. If the dams went, there would be other ways of getting grain downriver to Portland and other ports. But there would be no way to barge them there from Lewiston. Let's hear it, briefly, for the defenders of Snake River barge traffic. Critics speak scornfully of Lewiston, more than 400 miles from the sea, functioning as a deepwater port. It's absurd. Of course, it is. But how about building a city of 15 million people in a semi-desert? That's Los Angeles. And no one is going to breach the aqueducts that keep it in business. Or turn Phoenix back to the desert anytime soon. Here in the West, there's plenty of geo-political illogic. We have made the desert bloom with crops in California, Arizona, Utah, the Columbia Basin, and with buildings in LA, Phoenix, Las Vegas. Lewiston's tenure as a deepwater port seems shaky not because it's so ridiculous, but because it's ridiculous and relatively small-time. Nevertheless, it endures. One can argue that the political strategy followed by most of the region's Senators, Representatives and Governors -- and the administrations of George W. Bush and Barack Obama -- has been wildly successful. More than 20 years after the first Snake River salmon population was listed, the status quo remains largely intact. If the history of such things gives any indication of the future, the new biological opinion due by New Years of 2014 will just kick off more years of litigation and negotiation. Judge James Redden made it clear that his patience had run out -- but Redden has retired. His successor may give the feds more leeway. And what then? The federal government still shows no desire to consider breaching or any other substantial change. If that turns out to be the case, the feds will probably keep losing in the courts -- but so far, that hasn't cost them much except time and dollars. Are many politicians ready to move beyond that world view? "We believe leaders in the region are ready and willing to support a broader discussion of steps that can be taken to manage our hydro system in ways that benefit salmon, power and transportation interests, and that could avoid another round of costly litigation and uncertainty," Kitzhaber wrote. Does he really believe that leaders in the region are ready? If they are, that's big news. The environmental and tribal groups that have applauded his op-ed clearly doubt it. They hope that Kitzhaber can help nudge those leaders into useful action. Kitzhaber made it clear that he wasn't talking only about elected officials. "[W]e need the BPA, the Corps and the Bureau of Reclamation to step up to the table," he wrote. "By gathering the parties around a table, and working in good faith to reach common ground on a fisheries plan that is supported by sound science, we can come to the 2014 deadline with a historic agreement that ends the 20-year chapter of salmon wars in the Columbia basin. . . I don't want to imply this will be easy. . . . But the time to try to solve our differences is now." Indeed, the time would seem to be now, not least because the federal government must come out with a new BiOp by the end of the year, whoever sits in the White House will have some semblance of a mandate and the Bonneville Power Administration -- long the 800-pound gorilla of Columbia River politics -- will have a new chief executive. This provides an opportunity for statesmanship on the national level. Twenty years ago, when environmental groups were suing to protect the Northern Spotted Owl and the remaining unprotected old-growth ecosystems in which it lived, and the late U.S. District Judge William Dwyer had enjoined timber sales on federal land until the government complied with federal law, candidate Bill Clinton promised that if elected, he'd bring people together to talk about the owl wars, and then find a way out of the impasse. The next year, he held a day-long Northwest Forest Conference in Portland, and a year after that, his administration came out with a Northwest Forest Plan -- which was attacked for going too far and for not going far enough, but which withstood legal challenges and persuaded Dwyer to lift the injunction. A President, a Secretary of the Interior -- maybe even a United States Senator from Washington State -- could exercise similar leadership next year. Or not. The status quo remains alive and well. Maybe no one will stick his or her neck out until another federal judge emulates Dwyer and just decides to shut it all down.